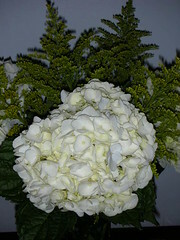 White hydrangea bouquet in the foyer. The fall color on the trees is just about at its peak here, so I got these gorgeous white hydrangeas that have just a hint of green in them. That way the cut flowers won't compete with the red, orange and gold in the yard. Pretty.